The foremost single-line transplanter available today is the Checchi & Magli Texdrive transplanter. A single operator can place one row of plants on each bed using the six-cup carousel. Reliable land wheel drive combined with exceptional timing adjustment make the Texdrive very accurate in placing each and every plant. Texdrive is the best transplanter for cauliflower and pepper. Click here to see the Texdrive transplanter in action. Planting two rows on a single bed is possible with the Checchi & Magli Dual-12 Gold transplanter. The rows can be as close as 12-inches apart, and the plants are placed in an ideal staggered alignment. The 12-cup carousel allows for a single operator on each bed, significantly reducing labor costs. Dual-12 is the best transplanter for celery, lettuce, and broccoli. Click here to see the Dual-12 Gold transplanter in action. Some transplanters deal well with very developed leaves, but most cannot handle tall plants. The Checchi & Magli Trium and Baby Trium transplanters handle tall and leafy plants with ease. Varying soil types and moisture conditions are no trouble for the Trium's versatile chassis and packer wheels. Trium is the best transplanter for long or tall transplants, tomato, leek, and cabbage. Click here to see Trium transplanters in action. 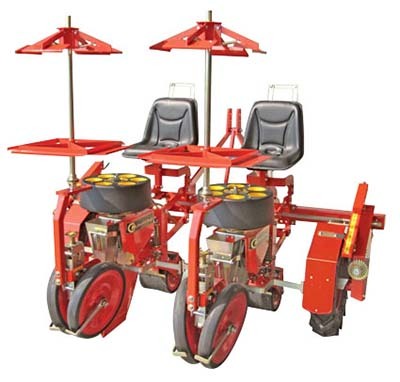 The Checchi & Magli Wolf transplanter has revolutionized plastic mulch transplanting. Traditionally, planting through plastic mulch involves time consuming, laborious, hand-planting. This is no longer necessary with the Wolf transplanter. Wolf transplanters feature a unique planting cup that perforates the plastic, then accurately places each plant. Wolf is the best transplanter for plastic mulch transplanting. The Checchi & Magli Wolf Bi-Row transplanter efficiently plants two staggered lines through plastic mulch. Add the innovative 12-cup Fastwolf carousel and a single operator can do twice the work, making the Bi-Row even more efficient. The Wolf Bi-Row is available in three, 2-line widths: 9.5-inch, 10.5-inch, and 12-inch. Wolf and Wolf Bi-Row are the best transplanters for any through-plastic planting, and are also suitable for conventional transplanting. Click here to see Wolf transplanters in action.